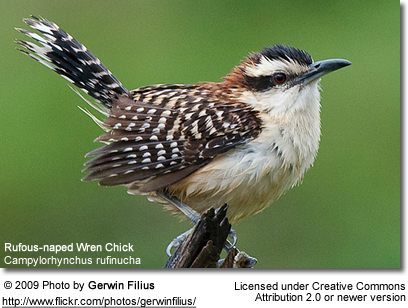 The Rufous-naped Wren (Campylorhynchus rufinucha) is a small songbird of Wren family. It is a resident breeding species from central Mexico to Costa Rica. This large wren breeds in lowlands and foothills from sea level up to 800 m altitude in forest or open woodland, scrub, second growth and savanna. It mainly occurs on the Pacific side of the central mountain ranges. Its spherical nest has a side entrance and is lined with seed down. It is constructed 1.5 – 8 m high in a thorny tree or shrub, especially bull’s-horn acacia. The female alone incubates the three to five brown- or black-spotted white eggs for about two weeks to hatching, and the young fledge in about the same length of time again. After breeding, families sleep together in dormitory nests like those used for breeding. 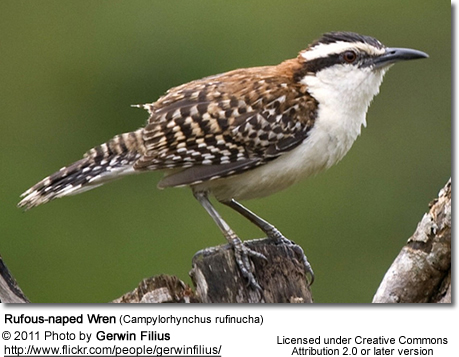 The adult Rufous-naped Wren is 17 cm long and weighs 36 g. It has a black crown and eyestripe separated by a strong white supercilium (line above eye), a rufous nape, and cinnamon brown upperparts streaked with black and white, especially on the rump. The wings and tail are barred with black and greyish-white. The underparts are white. 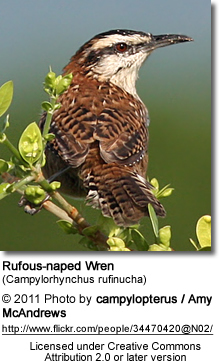 Young birds have duller upperparts and buff underparts. This species is often tame and inquisistive. This species has a short rasping call. The song is a mix of rich whistles, chatters and gurgles often given as a duet. 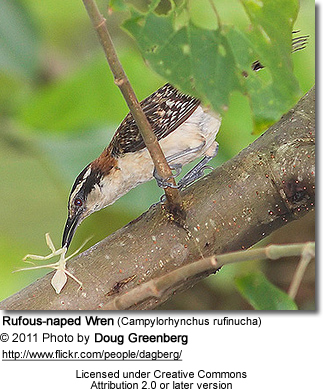 The Rufous-naped Wren forages actively in low vegetation pairs or family groups. It eats mainly eats insects, spiders and other invertebrates.